Welcome to Found Off The Street, our look at cars found on the cape that rust liked so much it decided to summer there; Cape Cod, MA. Today we have a 1965 Triumph TR4A. Last week's 1970 International Scout 800A managed to defy its rust prone nature in a rust prone area. This week's 1965 Triumph TR4A was not so lucky. Years of salt air on the cape that rust remembered have taken a serious toll on this old British sports car. This TR4A's future is limited to sitting until perhaps someday it gives up parts of itself to bring another old Triumph back to life. This TR4A is part of a series of Triumph sports cars that began with the introduction of the TR2 in 1953. 1981 was the last year of TR8 production, ending a 28 year run of TR sports cars. One of the many models produced between the first TR2 and the TR8 was the TR4A. Built between 1965 and 1967, the TR4A was a slightly updated version of the TR4. The primary difference between the TR4 and the TR4A was the optional Independent Rear Suspension. About ¾ of TR4A's were produced with the new IRS option while the rest retained the live rear axle previously used on the TR4s. Like the other 28,464 TR4As produced during their short model run, this week's FOTS car is powered by a torquey 2138 cc inline 4 cylinder engine with a 4 speed transmission behind it. The 104hp engine was capable of pushing the little car to a top speed of 110 MPH when new. As you can see from the pictures, this week's TR4A has traveled quite a few miles and seen quite a bit of wear and tear since it left England for the US years over 45 years ago. This TR4A has been sitting where you see it currently for as long as I can remember. The Triumph's owner had a similar time estimate when asked about it. Sitting alongside a repair shop with a few other cool and weathered old vehicles, the Triumph will likely remain where it sits for a while longer. The body is very rusty, but the frame is solid and everything mechanical is there, albeit in unknown condition. It seems like the Triumph is complete. For whatever reason, like so many other old cars, one day it was parked never to be started again. Seeing any old British cars on the cape that rust remembered is a fairly uncommon occurrence, regardless of the condition. Every time I drive by this TR4A it reminds me of the so far unexplored small British car segment of my automotive bucket list. It is for this reason I hope this TR4A remains where it is for years to come, reminding me how much fun it looks to pilot one of these down the road. The owner says the TR4A is for sale, although I don't think he's actively trying to sell it. 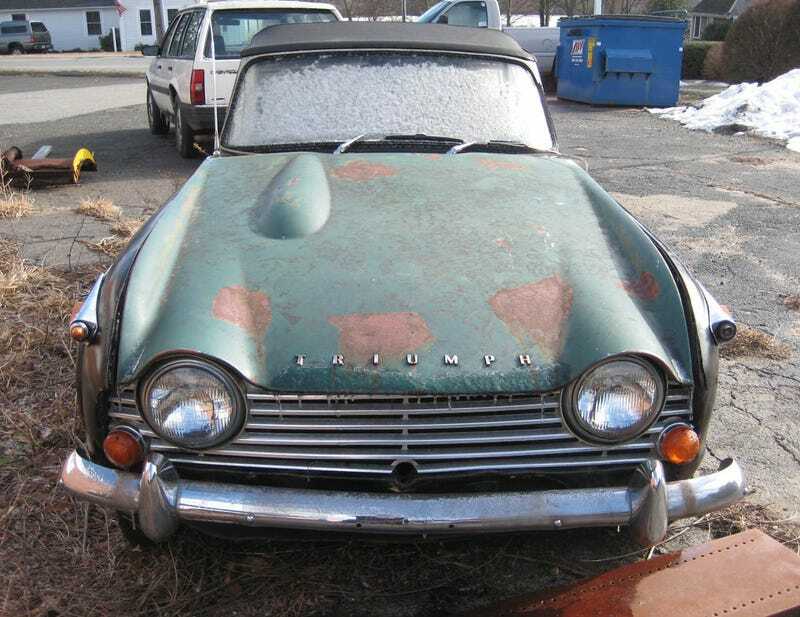 Body rust and lack of title mean the old Triumph will likely trade hands one last time for use as a parts car. For now, the TR4A sits untouched, slowly succumbing to the effects of many years exposure to New England weather while it waits out the remainder of its days.